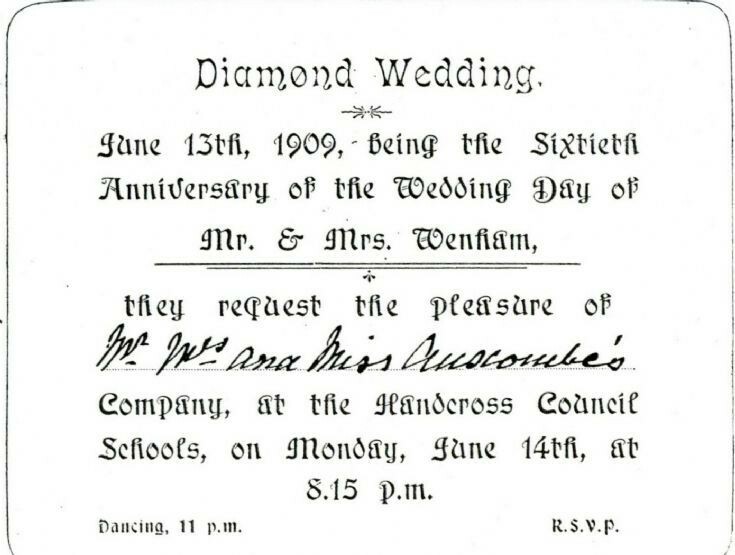 George Wenham married Emma Cousens on 13th June 1849 and they decided to celebrate their Diamond Wedding at Handcross School on Monday, 14th June 1909. I presume it would not have been considered proper to hold the party on a Sunday! At the time, they were about 83 and 78 years of age respectively, but that did not deter them from inviting all their friends to join them in dancing until 11.00pm! During the evening it is recorded that Mrs Wenham gave a rendering of a song called “Mrs Brown and her luggage”. Incidentally, the plural use of “Schools” was frequently used in those days as the boys and girls were counted as having their own school, each with a separate door and lobby entrance at the front of the building. Mrs Emma Wenham ran the Dame’s School very strictly and if any child talked too much they had to sit in the doorway with a long red flannel tongue tied around their necks in full view of passers-by. No photographs exist of this public shaming, but a cartoon drawing can be seen at picture #95. The invitation was sent to bootmaker Arthur Anscombe (see picture #441), his wife Catherine, and their daughter, 11-year-old Ena Victoria. It is interesting to note that Ena Victoria was born about a month before Queen’s Victoria’s Diamond Jubilee on 22nd June 1897. There are no prizes for guessing why she was given the name, Victoria! At a more local level, in 1924 Ena went on to marry Ralph Tulley who, with his brother Harold, ran the Post Office stores in Handcross. A photograph of Mr and Mrs Wenham can be viewed at picture #1641.